Last month’s Absolute Return Letter on freshwater scarcity caused more than a modest stir. Most months I get 10-20 emails from our readership, most of which contain questions that can be dealt with instantly, but this month was different. Everything from “what a brilliant piece” to “you are a nutcase – you don’t understand anything” popped up in my inbox, in the first few days following the publication. Apart from the fact that I don’t entirely disagree with the latter observation, allow me to make a few comments before moving on to this month’s topic. One frequently asked question in the emails to me was “how do I invest in water?”. As many of you know (because I have said so many times before), regulations prevent me from being too concrete on those sorts of things, as it is perceived as marketing. On top of that, we are still early in our own research into water but, should you be interested, drop us a line and we will be in touch when ready. In that context, take a quick look at exhibit 1. According to the findings of Preqin, water is not (yet?) on the radar screen of that many investors, which is a major plus in my book. Just saying! And now for something completely different, as they say. What happens when you earn less (in real terms) than you did last year? You are forced to cut back on things you enjoy, and you feel that your living standards are moving in the wrong direction. Now, add to that the unpleasant scenario of your life savings – your retirement pot – dwindling. The pressure rises. You begin to have sleepless nights, and you are prone to making irrational decisions. Quite often (but not always), you also turn more left-wing in your political convictions. This is precisely what has begun to happen in the UK after years of declining real wages (exhibit 2) and falling property prices in parts of the country (exhibit 3). To a large degree it explains the UK’s decision to exit the EU, and it explains why Jeremy Corbyn has suddenly got plenty of momentum whereas, not that long ago, he was the laughing stock of Westminster. The principal retirement pot for most Brits is the house they live in. Decades of solid property performance (with only a few hiccups) and a high ownership ratio are the key drivers behind this phenomenon. 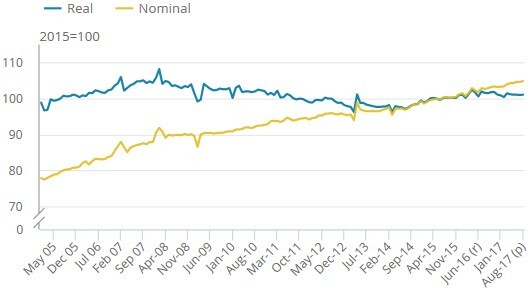 It is not at all unusual for ordinary Brits not to save much otherwise. 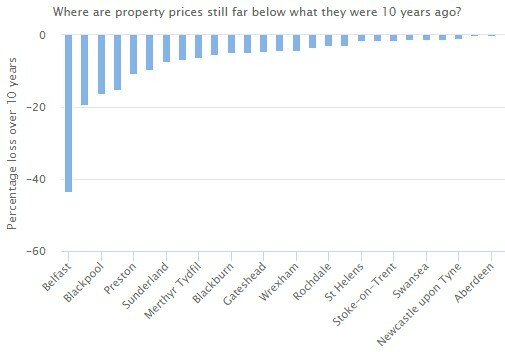 With declining property prices over the past 10 years in the constituencies listed in exhibit 3, it is hardly a surprise that almost all of them voted Leave. Only Belfast and Aberdeen had a solid majoritry in favour of Remain (for other reasons, Northern Ireland and Scotland are both solidly pro-EU), whereas Newcastle is the only English constituency listed in exhibnit 3 that voted Remain, and the majority was tiny. When your 12-year old daughter calls you in the middle of an important meeting, you fear the worst. Has anything untoward happened? “Dad, can I have the new iPhone 8? Come on Dad, it is only £700! What do you mean we don’t have that kind of money? Can’t you borrow some?”. Thankfully this didn’t happen to me, but it happened to someone I listened to on the radio the other day (even in these streaming times, some of us still listen to the radio every now and then). Britain has become a very expensive country to live in. An Italian acquaintance of mine, who lives about as far from Rome as I live from London (about 30 miles away), spends the same amount of money on his season ticket every year as I do on mine every month. And sending your kid to university in England sets you back £9,250 - per year that is. When real wages don’t rise for an extended period of time, something has to change, people say to themselves. What’s easier than to blame it all on the establishment and on Brussels? The something that has to change is suddenly spelled B-R-E-X-I-T. However, it is pretty obvious to the well-informed that the EU is just a symptom; the root cause is something altogether different. The oddest thing of all is that the employment market is extraordinarily robust at present. The UK jobless rate is now 4.3% - the lowest since 1975 which, for all intents and purposes, suggests full employment; yet wages continue to grow below the rate of inflation. Leading UK economists are now warning that households in this country are at “breaking point” after having suffered declining real wages for years (see the story here). In an international context, the UK is not the only country having experienced declining real wages in recent years, but it is still doing poorly in the international league tables (exhibit 4). Only Greece, with loads of problems of their own, has fared worse. Many observers have argued that it is all because of Brexit. A sharp decline in the value of the pound, following last year’s EU referendum, has indeed had a significant impact on UK inflation due to the high proportion of imported goods sold in this country every day. The impact of the weak currency has been further accentuated by British companies sitting tight, following last year’s referendum result. If you don’t really know what sort of implications Brexit will have (and we still don’t), playing a defensive game is perfectly understandable. It is therefore correct that Brexit has been a contributing factor; however, real wages started to decline many years before the EU referendum in 2016. Brexit can hardly be the root cause, then – there must be other dynamics in play. Weak productivity growth across the UK economy is one dynamic often mentioned. However, declining productivity growth is not at all a problem unique to the British economy (see exhibit 5 for two other examples). One could therefore argue that, if weak productivity growth is the root cause behind declining real wages, many other countries around the world should suffer a similar fate, and most countries don’t, as we saw in exhibit 4. That said, weak productivity growth almost everywhere has held back, and continues to hold back, real wage growth globally, even if few countries have been through as bad an experience as the UK has. What else could explain this rather strange phenomenon then? Why have British workers suffered more than most since the Global Financial Crisis? You may be surprised now, but I am about to reveal that I haven’t figured it out yet. That said, I have two prime suspects. In late 2015, BofAML published a very comprehensive research paper on advanced robotics (called Robot Revolution – Global Robot & AI Primer), where they concluded that, by 2025, robots will have taken over nearly 50% of all manufacturing jobs and shaved $9 trillion off labour costs globally. The driver? First mover advantage. Let’s look at which countries have already caught on to the automation trend. As you can see from exhibit 6, South Korea is way out in front, whereas Japan and Germany aren’t doing too badly either, so no surprises there. Now let’s look at who is asleep at the wheel, and the UK pops up straight away. 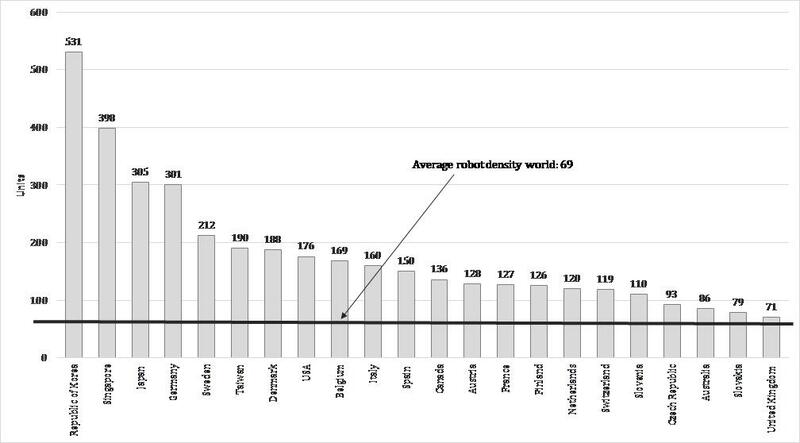 Compared to the world’s leading industrial nations, the UK has installed so few industrial robots that it shouldn’t surprise anybody that UK industry struggles to compete internationally. And, if industry struggles to compete, one obvious fix is to reduce labour costs; hence low automation could very well be the true root cause behind the decline in real wages in the UK. Having said that, I am not 100% satisfied with that explanation. The US, which is way ahead of the UK in the automation league tables, have also seen real wages under considerable pressure for many years. Could something else be behind all of this? My alternative explanation requires that I take you back to school for a minute or two. As you may recall, in the national accounts, national income is ultimately shared between labour and capital. The split between the two is not exactly the same from country to country but, at least until the 1970s, the ratio was nearly constant everywhere. In the US, two-thirds of national income went to labour and one-third to capital. In the UK, labour took about 75% of national income. Every year. The British economist Arthur Bowley was the first to observe this regularity, and thus it became known as Bowley’s Law. In the 1920s, the American economist Paul Douglas made a similar finding in the US and developed, together with the mathematician Charles Cobb, the now famous Cobb-Douglas production function, which has led a whole host of other economists to conclude that labour’s share of national income is virtually constant. That is precisely how it worked until the 1970s. Then things began to unravel. Year after year, labour lost a little bit to capital (on average about 0.3% per year) and, although the accumulated loss since 1970 is quite different from country to country (exhibit 7), almost all countries have seen a meaningful chunk of what used to be labour income going into the pockets of capital owners. This trend could explain quite a few things. It could certainly explain why real wage growth has turned negative in some countries. If the total pot available to labour is shrinking, no wonder the average worker loses out. Why California? Unfortunately, I don’t have the corresponding numbers for the UK economy, but the Californian numbers cannot be miles away from the equivalent UK numbers, given the similar demographic profiles in the two countries. It could also (at least partly) explain the extraordinary strength of the equity bull market since the early 1980s. If capital grabs a bigger and bigger share of national income, all other things being equal, equity returns should benefit. And it could explain the turnaround of the UK Labour party and Jeremy Corbyn. Even if the man in the street doesn’t necessarily understand the underlying dynamics, he certainly realises that something must change. Having said that, it cannot be the only explanatory factor. If it were, capital would have seized a much bigger share of national income in the UK than it actually has. This leads me to conclude that more than one underlying dynamic explains this phenomenon. Before I suggest how this could all pan out, allow me to make one further observation. The fact that labour has lost out to capital for several decades has led to what is frequently referred to as the elephant chart (exhibit 8). If you take a closer look, I am sure you can see the resemblance with an elephant. 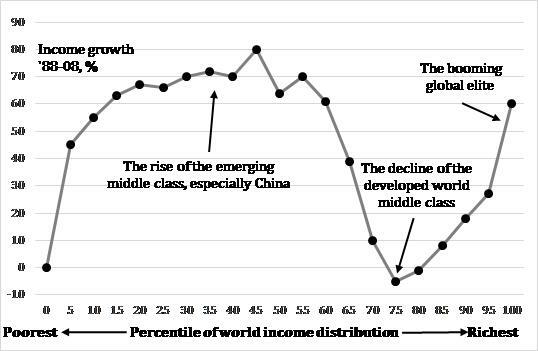 As is evident when looking at the chart, the middle classes of the developed world have been the biggest losers over the past few decades. Their income growth in the 1988-2008 period was negative and, even more remarkably, it was lower than that of the world’s poorest. The chart is admittedly a tad long in the tooth. That said, other information I have access to confirms that the trend continues to this very day, so don’t expect me to conclude any differently, had exhibit 8 been up-to-date. Meanwhile, EM middle classes have done well, and so have the global elite. No wonder the man in the street in our part of the world is not particularly happy. Whether governments are prepared to address the problem is an altogether different question. So how could it all pan out? Going back to the Cobb-Douglas function referred to earlier, if the production function that determines how national income is shared between capital and labour is Cobb-Douglas in nature (and I am yet to hear a convincing argument why it isn’t), labour’s share of national income will, sooner or later, return to the levels we experienced until the 1970s. That would imply a significant drop in capital’s share of national income in virtually every country to the detriment of global equity markets. Furthermore, for reasons I shall not go into details on in this forum, if the production function is indeed a Cobb-Douglas function, wealth-to-GDP is also long-term constant. The long-term mean value of the US wealth-to-GDP ratio is about 3.75 times, whereas the European average is about 4.7 times, with the difference down to variations in the efficiency of capital - the US economy being the more capital efficient of the two. Think of the wealth-to-GDP ratio as the capital-to-output ratio, and think of that ratio as the amount of capital it takes to produce $1 of output; i.e. 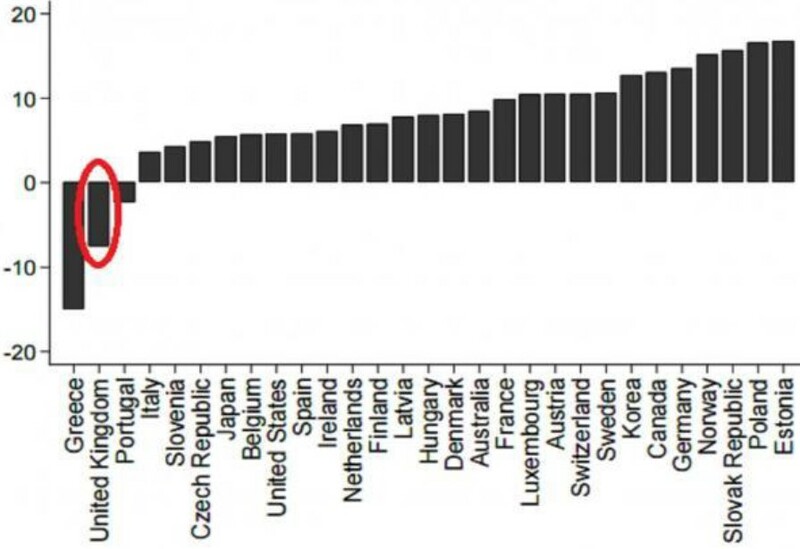 it takes (on average) $3.75 of capital to produce $1 of GDP in the US, whereas it takes $4.70 in Europe, and the fact that the US ratio is now 5.0 tells you that the US economy has become less capital efficient. Now, if wealth-to-GDP in the US must drop to 3.75 times, one of two things may happen. Either private wealth will drop 25-30%, or the numerator (wealth) will grow more slowly than the denominator (GDP) over a longer period of time. Should the first happen, three asset classes are particularly at risk – equities, bonds and property, with property being mostly exposed, as it is the primary source of private wealth in the Anglo-Saxon countries. If the latter were to happen, given that GDP won’t grow particularly fast for many years to come, financial asset prices could move virtually sideways for a painfully long time. The one question you are not supposed to ask now is “When will all this happen?” Unfortunately, there is no simple answer; there is no mathematical solution to that question. However, if you think back to the period around 1980, a few things happened that could provide some answers. The Fed under Volcker’s leadership won a major battle against inflation, and two neo-liberalists took control of two of the largest economies in the world – Reagan in the US and Thatcher in the UK. Both developments help to explain the extraordinarily good times investors enjoyed the next 20 years. Iron curtains were taken down and trade tariffs removed. In today’s environment of neo-nationalism, exactly the opposite is happening. Hence, if my assumption that wealth-to-GDP must mean-revert sooner or later is correct, the era of neo-nationalism could be what kicks off the mean-reversion process. As far as the UK government is concerned, pursuing an economic policy of this nature will eventually prove to be a massive own goal, but the ultimate winner will most likely be the man in the street, and that’s really all Corbyn cares about. Author: AbsoluteReturnPartnersAbsolute Return Partners is a London based investment advisory business. Founded by Niels Jensen in 2002, we focus on providing bespoke alternative investment solutions to institutional investors. In total we manage over $600m of assets across our group. ARP is owned by its management team. We are protective of our independence and equally protective of our clients’ investments. There are no external vested interests in our organisation.